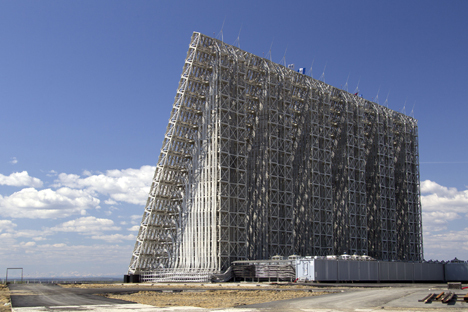 The Oko-1 ballistic missile early detection system, which formed part of Russia’s missile attack warning system will be superseded by a new unified outer space system capable of tracking tactical missiles as well as ballistic ones. It came to light recently that the last geostationary satellite of the Oko-1 ballistic missile early detection system had gone out of commission. The 71H6 apparatus, put into orbit in March 2012, was operational for only a third of its expected working life. The loss of the satellite weakened the outer space segment of the missile attack warning system (MAWS), which is one of the main elements of the country's strategic defense system. Igor Lisov of trade magazine Cosmonautics News told RIR that MAWS is still fully operational. Despite the fact that the geostationary satellites have been lost, the Cosmos-2422 and Cosmos-2446 satellites, which operate in high orbits, are still running. According to Lisov, geostationary satellites and high-orbit satellites can typically compensate for one another, but under the current circumstances, it is difficult to confirm that this is the case here. Only two of the four satellites are in normal operation, which is the bare minimum necessary to do the job. The remaining satellites are struggling to cope with the workload. According to an RIR source close to the Ministry of Defense, the lack of geostationary satellites is being compensated for by new horizon radar systems known as Voronezh-M and Voronezh-DM. Located in the Kaliningrad, Leningrad, Irkutsk, and Krasnodar regions, these stations operate in two frequency ranges: the meter range (Voronezh-M) and the decimeter range (Voronezh-DM). They create a radar field, which makes it possible to easily detect space objects and effectively prevent missile attacks. According to the source, Oko-1 will not be reinstated at any point. The system was hopelessly outdated, having been created during the Soviet era. Now the Ministry of Defense has tasked itself with creating a unified outer space system. The new system will perform at a higher level, and will track not only ballistic missiles, but tactical ones as well. The new system’s first satellite will be launched later this year, but the exact date has not yet been announced. MAWS is one of the most important deterrents to missile attacks. It contains a radar station, horizon detection, a group of artificial earth satellites, and radar horizon detection. The first part of the MAWS system, which went operational in 1971, could launch ballistic missiles at any time in just a matter of seconds, in real time, and with high reliability. Its mission was to inform the state’s leadership of the launch of ballistic missiles from anywhere in the world. The early warning detection system was the last word in the retaliatory decision-making process. Initially, MAWS worked from radar stations, which were based far away from major residential areas. Erected around the perimeter of a country, the surveillance zone stations monitored areas from which missiles could be launched. However, by virtue of its design, the horizon radar "saw" intercontinental ballistic missiles launched from United States territory, as well as missiles launched from submarines in the ocean, only as they were on the downward leg of their flight trajectory. This meant that missile radar warnings could only be issued rather late within a territory, which did not allow for much time in the decision-making process. This design flaw led radar groups to add a set of tools that would make it possible to immediately detect missiles at the beginning of the launch phase, regardless of location. In the early 1970s, the idea originated for a missile warning system that was space-based and designed according to a tier system. By 1979, the system was launched, and in 1982, the first of four generations of 74D6 (US-K or Oko) satellites for high orbits was placed on alert. The satellite was only able to track missile launches from within the U.S. In addition to the satellites that have been in operation since 1984, a US-KS (Oko-S) satellite has also been in geostationary orbit. In 1991 a second-generation system went into parallel development: the Oko-1 (US-KMO) and 71X6 geostationary satellites. The upgraded Oko-1 system was also able to record sea-based missile launches and determine their flight trajectory. The complete system was to include up to seven devices, but the last one was put out of commission in June 2014 due to a technical failure.